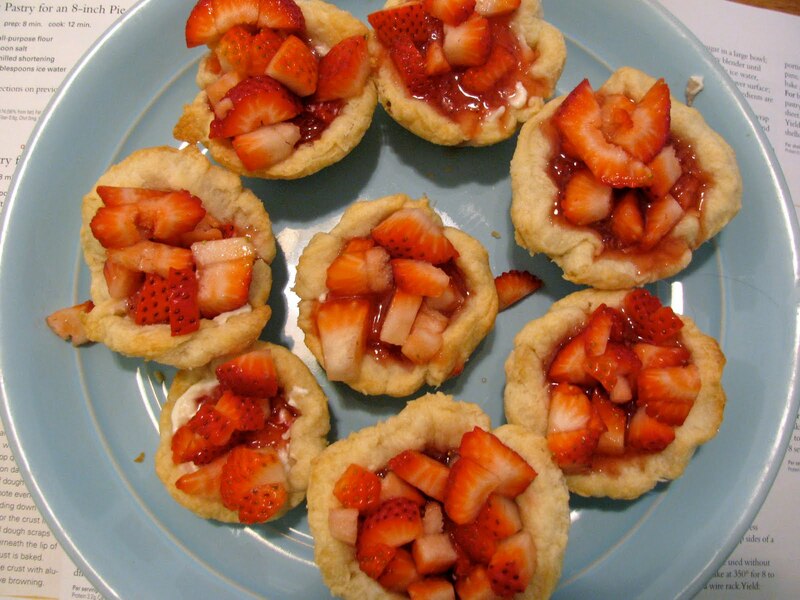 In small saucepan, combine sugar, water, and strawberries. Heat until boiling; reduce heat and simmer for three or four minutes. Cover and let stand in refrigerator for about 15 minutes. 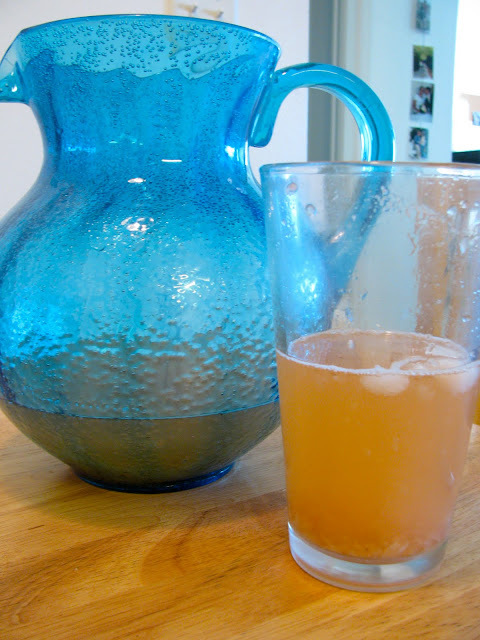 In pitcher, combine water and lemon juice. Add strawberry syrup and stir; serve over ice (if you serve the lemonade right away, it will still be warm from the syrup, so don't skimp on the ice!). Enjoy. I also would love to try this with blueberries, raspberries, blackberries, etc... the options are endless! Preheat oven to 375. Heat olive oil over medium-high heat in skillet. Mix breadcrumbs (about 1/3 cup) with about 1 T italian seasoning. 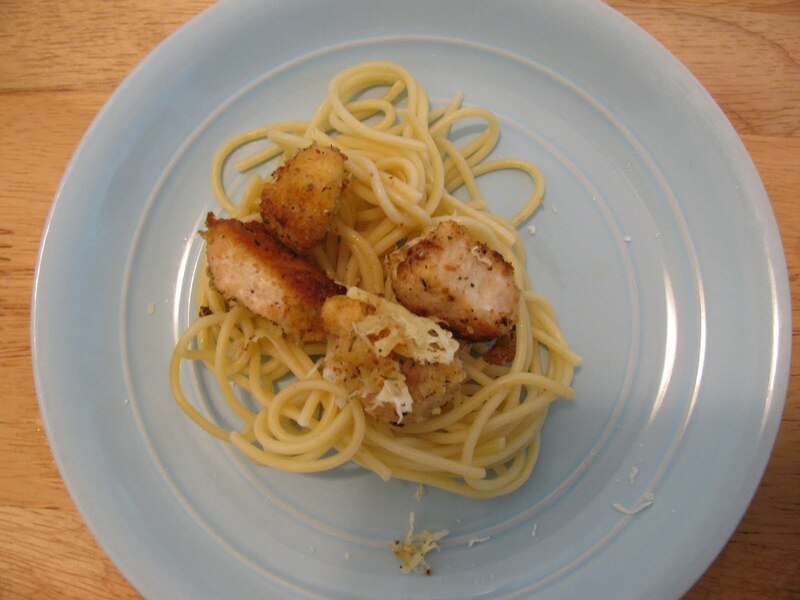 Toss chicken breasts with breadcrumbs and fry in skillet until lightly browned on each side. Transfer browned chicken into casserole dish; cover with foil and bake at 375 for 25 minutes. Uncover and sprinkle with parmesan cheese; bake for another 10 minutes. Serve with tomato sauce, or if you discover you have no tomato sauce halfway through cooking your meal (like I did), with lemon dressing (mince one clove garlic and add to 2 T olive oil; heat in microwave for 1-2 minutes; stir in 2 T lemon juice). Serve over pasta; top with parmesan cheese. Prep time: Medium... at least compared to the tortillas you pull out of a bag! Growing up, I LOVED it when my mom made fresh flour tortillas. Fresh flour (I can't believe I initially spelled that "flower"! yikes!) tortillas + crock-pot cooked pinto beans was my idea of heaven. 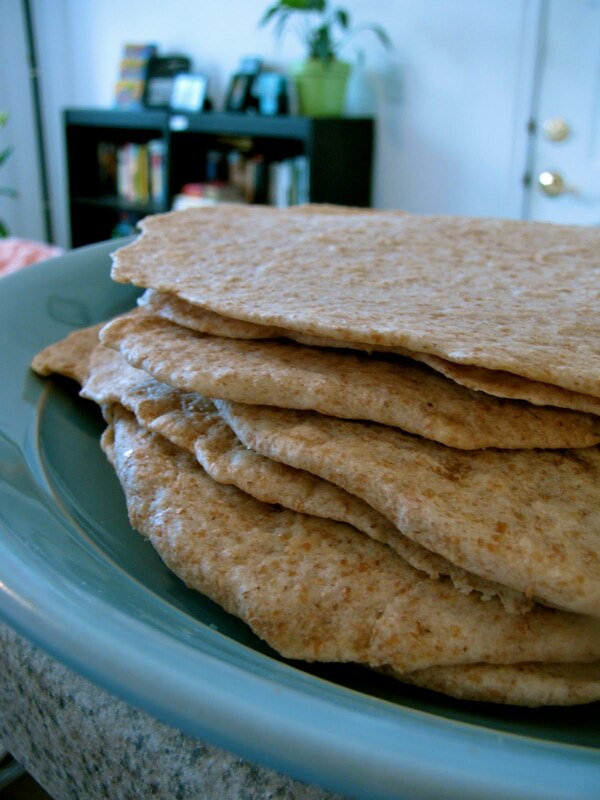 These tortillas have so much more flavor than tortillas from a bag! Now, we make them once every week or two. In this particular picture I used 1/2 wheat 1/2 white flour, but I sometimes do all white flour—they are both good in different ways. Heat pan or griddle to about 325 (do not grease). In a large bowl, combine flour, salt, and baking powder. With pastry blender, cut in shortening or butter (tip: if you are using refrigerated butter, slice before adding to flour mixture for easier blending). When shortening/butter is mostly blended, add water gradually (I usually start with 1 cup, mix, and then add the water about 1/4 cup at a time after that) until dough is moist and holds together without being sticky. Knead with hands for a minute, then divide into balls a little bigger than a golf ball. On VERY VERY lightly floured surface, roll balls as flat as possible and transfer immediately to hot griddle or pan (otherwise they will puff up). Cook a few minutes on each side, until tortilla is just beginning to have golden-brown spots but still flexible. Fill with your normal taco filling. Rating: 5 stars for heartiness and great for soup! This, paired with Panera soup, was my lunch today. 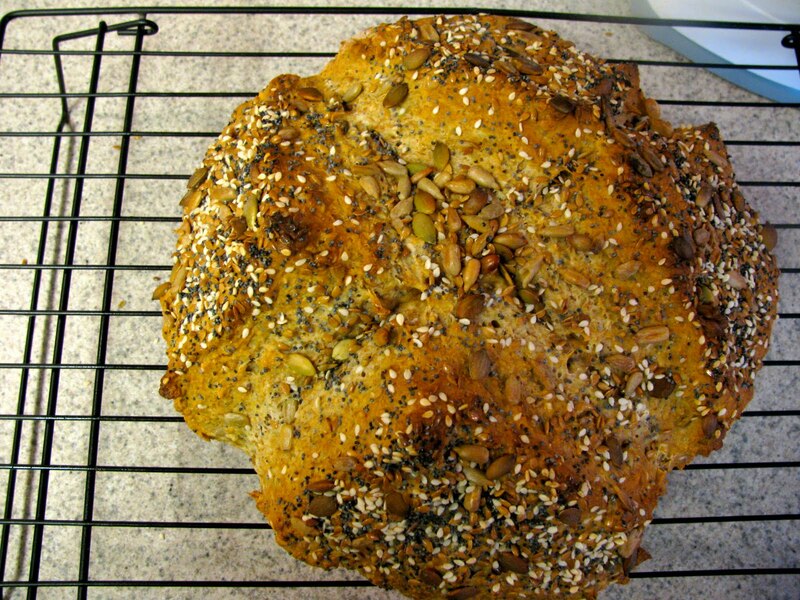 It's definitely denser and heartier than a yeast-risen bread, but oh my goodness, was it good!!! It was absolutely divine paired with the broccoli cheese soup. I might never be able to serve the two dishes apart again! Not to mention, it was so EASY and so GORGEOUS! Preheat oven to 400 degrees (really, let it preheat all the way before you start making the dough—the dough makes up very fast and you want your oven to be all the way hot when it goes in). Place a rack in the center of the oven. Mix all seeds together in a bowl; set aside. In larger bowl, combine flours, baking soda, and salt. Mix in all but 2 tablespoons of seeds. Create a well in the center of flour mixture and pour in 1 3/4 cup buttermilk (or substitute). Mix until just combined (but not too sticky), then turn onto a lightly-floured surface and knead about one minute (add a little flour at this point if necessary) or until mixture makes a nice bread dough. You don't want to knead too long, as the bread should go into the oven ASAP. Lightly flour a cookie sheet OR line with parchment paper. Shape dough into a round loaf and place on cookie sheet; with serrated knife, mark deep X in top of loaf. Brush with remaining buttermilk and sprinkle with remaining seeds. (Next time, I'd mix some egg yolk in with the buttermilk as some of the seeds fell off after baking—although I'm actually pleasantly surprised by how well the buttermilk did hold them on.) 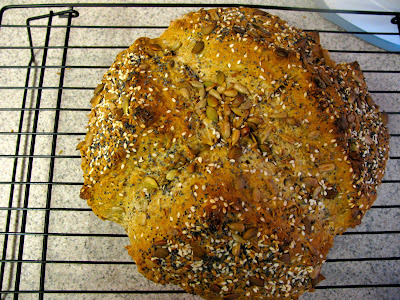 Bake for 35-40 minutes or until bread is a rich golden brown. Enjoy! Yields one loaf. For those more interested in the pie, I've put the pie measurements in parentheses. The tart recipe is intended to yield one dozen tarts, but it totally depends on how thinly you roll your pie crust—the first time I didn't roll it out very thinly, and we only ended up with 7 or 8 tarts. For tarts: Heat oven to 375. Roll pie crust as thin as possible (really, as thin as you can get it without it falling apart on you). Punch circles in pie crust with the biggest cup or other circle you can find—we used a 32oz hospital mug, which I think is about 5 inches in diameter. Gently stretch circles with your fingers, and place into cups of muffin tin. The edges of the crust should be at least as tall as or taller than the edges of your muffin tin. Prick crust with fork (including sides) and bake for 8-12 minutes or until very lightly golden. Once crusts are done baking, gently remove from muffin tins and let cool on a plate. While crusts are baking, mix sugar and cornstarch together. Fold in pureed strawberries and combine. Add water; heat until mixture has boiled for 1 minute (on the stove or in the microwave, either works—if you heat it on the stove, be sure to stir regularly). Let cool. Combine cream cheese, sugar, and milk. Once crusts are cooled, spoon a dollop of the cream cheese mixture into the bottom of each crust. Spoon a few of the chopped strawberries into crust (don't overdo it—these will fill up fast! ), using the spoon to pack them in if necessary. Gently spoon or pour glaze over the strawberries. Top with another layer of chopped strawberries. Add a dollop of whipped cream, and enjoy! They can be eaten right away (and trust me, we did), but the next-day leftovers are even better. For pie: Heat oven to 375. Roll out pie crust and place in pie dish. Prick bottom and sides with fork and bake for 8 minutes (or until done). While crust is cooking, mix sugar and cornstarch. Fold in pureed strawberries and combine. Add water; heat until mixture has boiled for 1 minute. Let cool. Combine cream cheese, sugar, and milk. Spread over bottom of (cooled) pie crust (if you don't let it cool a little, it will melt the cream cheese... ask me how I know!). Spread one layer of strawberries, sliced in half, over bottom of pie (cut sides up). Layer glaze over strawberries. Continue to layer cut strawberries and glaze until pie crust is full; top with whole berries. Serve with whipped cream.